The issues raised by Magdalena Zernicka-Goetz's work are controversial and challenging. 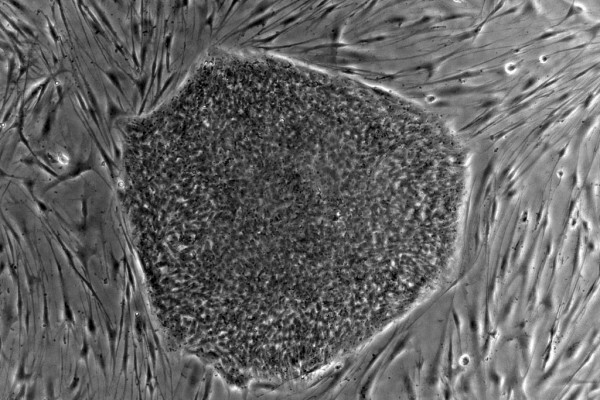 Just because we might be able to grow embryos longer than 14 days - and with it discover important clues about early human development and what goes wrong in infertility, miscarriage and some types of cancer - does that mean we should? Kat Arney speaks to Sarah Norcross, director of the Progress Educational Trust, whose December meeting brought together scientists, philosophers and even an ex-archbishop of Canterbury to discuss this thorny question. Sarah - We were thinking for our conference what would be really interesting? We always have to look for hot topics. Professor Azim Surani, who’s a geneticist, who has done a lot of embryo research at Cambridge, he was discussing at our conference in 2015 about the germ line in relation to mitochondrial donation. One of the questions that came out from the audience was, “What about if you could extend the amount of time you could do research on embryos for, would that be useful?” And he said, “Yes.” We thought this quite interesting. It did catch the media’s attention. But then when Magdalena Zernicka-Goetz, when her paper was published in Nature saying that she managed to develop embryos in vitro for up to 13 days, we thought, “Yes, this is a really interesting topic.” Because earlier this year in January 2016, that’s when Kathy Niakan was granted a license by the Human Fertilisation and Embryology Authority to do genome editing research in embryos. So because genome editing is a very new technology because we haven't started doing it in embryos in the UK yet because Kathy has just got her license. Well, if they did extend the period for which you could experiment on embryos, what would that mean in terms of genome editing technology? What could that possibly help us with? Would it help us just with understanding the basic science of something that is so fascinating and fundamental to us or the very early stages of human development – something that’s little understood and what the scientists call “The black box”. Would it allow changes to be made in embryos that can then in effect, eradicate disease because it will go from the germline? So, could we get rid of some conditions? There seem to be these possibilities and then of course, as soon as you start talking about those and people start thinking about enhancement, and how far should we go with this? Should we put checks and balances in place? And so, I think it was really important to start discussing genome editing and how long we should allow research in embryos to go on for before we call time on it? Kat - What really struck me from today’s meeting was that this really dates back to almost a very specific point in time to the birth of the first test tube baby Louise Brown in 1978 and the public suddenly going, “Wow! We can do this now.” And then from that, so you can do IVF, you can put an egg and a sperm together in a test tube, it will form an embryo. Some of those will be viable, some of those will not be viable. You can implant some of them back in the womb, some of them will grow to make a baby, some of them won't. What are some of the issues around researching in this area? Should we even be doing this? Sarah - I think there are many thousands of surplus embryos created through IVF. Some patients choose to donate those for research and that’s very laudable. When you think about all the research that needs to be done, it’s not just what the next “wow factor” scientific development may be. Kat - I guess, just research into how to make IVF better and more successful. Sarah - How to make IVF better is a real driver in this area because IVF, while it’s a successful treatment for many, it does fail a lot as well; the heartbreak that it causes people when it fails, and also because 60 per cent of people pay for their treatment in the UK, the expense when it fails as well is huge. So it’s an emotional expense as well as a financial expense. Kat - When we’re thinking about genetic modification of human embryos whether that’s for research purposes or even potentially for human modification, how important is it that you think the public understands what is going on because I think there have been some examples for example with GM technology and food where it’s being presented as, “Here's this. Enjoy! Eat this stuff.” People go, “Uhmm, I don’t like that.” How can we educate and inform the public about what really is going on here? Sarah - I think there are huge lessons to be learned, we’re determined to as the Progress Educational Trust to do something about that. So we’re starting to work on a project with small workshops to understand how people understand genome editing. So we’re taking people who are not scientists but who perhaps have got an interest in fertility. They perhaps work in a clinic or they represent a patient group, and to get them to give us their impressions about it, to have scientists explain it to them, and so that we can try and develop language of materials that will help a wider group of people understand the science behind it. So that we could explain to them in a way that’s accurate but not so heavily encumbered with difficult scientific terminology that they can get their brain around it, listening to it as a soundbite because unfortunately, I know for me, our time is so limited that we’re trying to get to grips with an issue by reading something really quickly. So we want to know about the paragraph at the most so they go, “Oh yes, I know about that now.” And then I can form my opinion on that because it’s similar to this or whatever else it is. And also because, I think it’s really important for scientists to speak to the public about their work, to get the public to understand what they're doing right from the beginning because I think otherwise, people think wrongly that perhaps they're hiding things, that there's something secretive going on, that there's a conspiracy. As soon as there's a sign there's a lack of communication, people project things onto that which is usually very negative. And so, I think by being open and transparent and say, “We’re looking at this. This is early stage. It’s not going to cure cancer. It’s not going to do this, but this is where we are and this is the start of something.” People can understand that and appreciate that that’s the way that science works. I think that’s going to be an important part of that, for people to understand that you don’t just come up with a light bulb moment that suddenly cures something. Sarah - Exactly, eureka! That’s the word. Kat - And finally, when we’re thinking about laws, we heard today from Baroness Mary Warnock who was one of the people who put together the legislation that says you can only go up to 14 days and the establishment of the Human Fertilisation Embryology Authority here in the UK that regulates human embryo work and human embryo research. is it really just down to scientists to tell us what they want to do and the public should just understand it and be okay with it? Sarah - No. I don’t think scientists do or should have the authority, power, whatever you want to call it, to tell the public, “This is what we’re going to do and we’re going to do it, and you’ve got to go along with it because it’s science.” They have to make the arguments for while it’s important, I really do firmly believe that they have to build a case for why we should change the law. We shouldn’t just do it because we can or we might like to, but they have to make some sort of justification. Because as well as the sort of public engagement work that Progress Educational Trust does, we also campaigning work. I don’t want to campaign for something just because someone thinks it’s a bit of a whim. Kat - This sounds like fun or my evil plan! Sarah - Yeah, my evil plan! For me, it’s got to have some value to society at the end to improve the choices for people who are affected by infertility and genetic conditions.